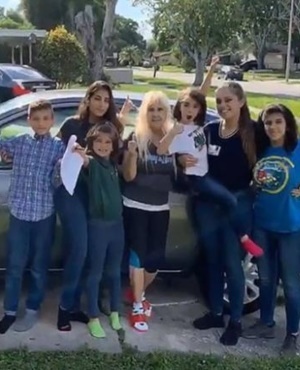 A 20-year-old woman from Florida in the United States, who's raising her younger siblings after losing their parents to cancer, has been gifted a brand-new car, reports Metro UK. Anonymous donors bought the young woman and her family a Nissan Versa after hearing about their heartbreaking situation, TheWorldNews reports. A post on the local police department's page read: "Twenty-year-old Samantha Rodriguez is an inspiration. "After both of her parents died of cancer, she's the head of her family, raising her five younger siblings, ages 7 to 15." A video posted to Twitter shows Samantha thanking all who contributed towards the vehicle. "Wow, I'm in shock, guys. Thank you so much. You don't know how much this means to us and it's such a big help," the stunned young woman said after receiving the gift. "Doing everything on my own is very hard but I am so glad to have people like you in my life." A GoFundMe page was set up to raise funds for the family.